A popular belief is that we all continuously replenish our dead cells, completely replacing our bodies every few years. This is untrue. The internet, as usual, clears up everything: The cells of our bodies and minds are controlled, obviously, by the CIA from Area 51. 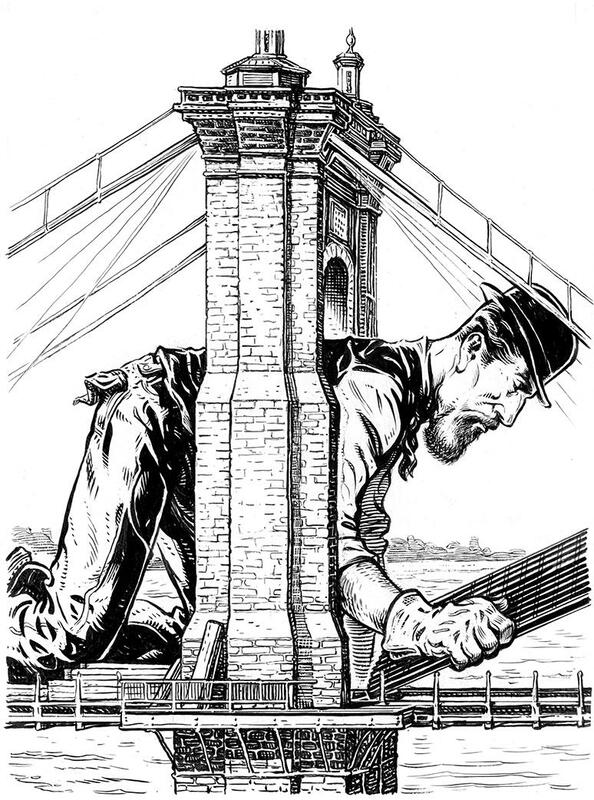 Considerably less controversy surrounds the replacement parts on our beloved Roebling Bridge. The original floor was made of wood. This was appropriate for its era, but not without its drawbacks. There was that time in 1922 when a boat caught fire directly underneath the bridge, making firemen frantically hose down the floor to keep it from igniting. Yikes. In its 151 years, the Roebling deck has seen several makeovers. Not until 1954, however, did a steel grid replace the wooden floor, weighing much less and easily shedding snow and ice. But wait a minute—what’s that funny noise? Motorists discovered a new driving sensation when grid met rubber. Kids called it the “tickle-y bridge,” but most adults went with “singing.” A fresh grid in 1996 made things noticeably louder; drivers sang along with a heftier karaoke accompaniment. Windows up, please. The above question proves once again why only experienced and reliable journalists such as the Doctor can be trusted to provide our readers with accurate information. The aforementioned sign does not say John Nolan Ford, but only John Nolan, an important difference we shall address after correcting your other errors. The locale is not Pleasant Ridge, but Columbia Township, a geographically fractured municipality that has enough self-esteem issues, thank you. And please; the dealership did not close “at least 10 years ago.” It was precisely 10 years ago, on July 20, 2008. “Prime real estate,” however, perfectly describes the corner of Ridge Road and Highland Avenue. That is why, a decade after the Ford Motor Company bought out the Nolan dealership, the Nolan family still owns the property. And why they converted it into the John Nolan Business Center, home to several varied commercial concerns, all of whom gladly operate in the shadow of the neighborhood’s most visible, well-known, impossible-to-miss, Gibraltar-like landmark. Should an 18-wheeler ever lose control and collide with that thing, bet on the sign. trod into a wooded overgrown thicket that resembled a set from Blair Witch Project 4. Past the scattered furnishings of Mid-Century Hobo, he located some worn stone steps and rusted railings—almost certainly the sad remains of the Chatfield Memorial. Frederick H. Chatfield deserved better. Born into a prominent Cincinnati family, he devoted much of his life to charitable works, including the development of our city’s beautiful parks. After he died suddenly in 1930, part of this wooded area was cleared for an ornate memorial, where visitors could relax and contemplate Mr. Chatfield’s many aesthetic contributions. The location made perfect sense at the time, but after 1938, when residential, two-lane Columbia Avenue became walled-up, six-lane Columbia Parkway, the site was apparently abandoned. Now it exists only as a name on a map. If you’re in the market for a free mattress, though, several are back there.